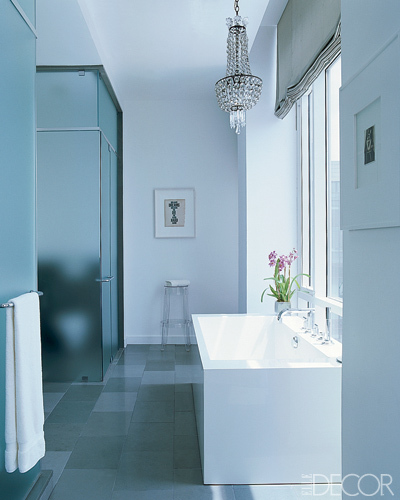 I absolutely love fashion designer Jill Stuart’s home from Elle Décor October 2009. It is contemporary, ethereal, homey and you can’t miss the fantastic views and art! This home really showcases the interconnection of design and fashion. Designed by Selldorf Architects. Check out the eye candy below! Poul Kjaerholm vintage daybed, burnished and tarnished just like a leather coat! Knoll sofa’s, rug by Carini Lang, FontanaArt floor lamp, and Geisha by Julian Schnabel. Ghada Amer’s Noired hangs above the living room fireplace. I love the candleholders strewn down the length of the table with the lovely whimsical flowers in between. Vintage lights by Carlo Scarpa, Sue Williams painting and candleholders by Ted Meuhling. Silk dhurrie by Vangerhurd Studio, Thonet dining chairs. 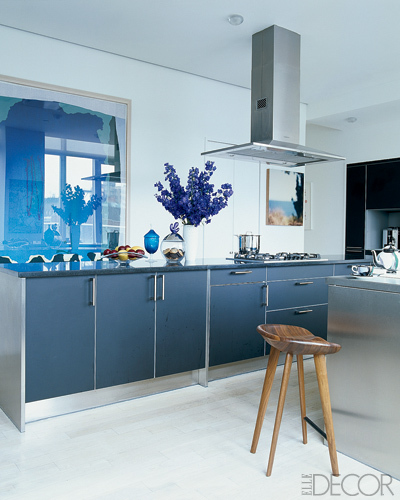 Bulthaup kitchen with Bassam Fellows walnut stools. 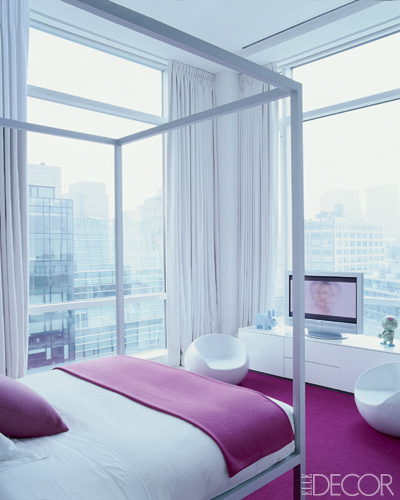 Jules Olitski’s White on White hangs above a Jasper Morrison bed from Cappellini. The super light Gio Point Leggera chair adds a acts as a nice counterpoint to the serene monochromatic scene. Gio Ponti desk turned into a vanity! The Lynda Benglis sculpture looks as if it is floating before the window. MDF Italia aluminum bed, rug by Vanderhurd Studio. Love the pink color coordination. B&B Italia Tufty Time sofa. 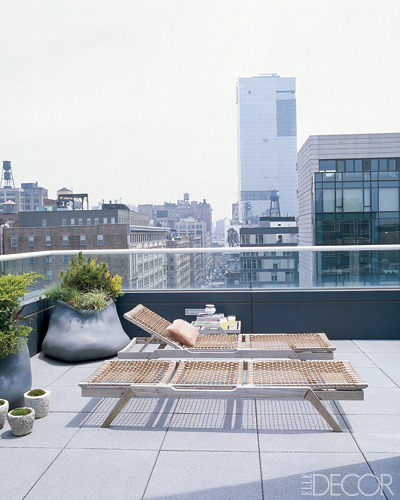 Gorgeous terrace with silicone planters by Paula Hayes and Design Within Reach chaise lounges.